Earlier this week, the Vanguard questioned the conclusions of the opposition to Measure L that the WDAAC was in violation of the city’s Affordable Housing Ordinance. However, City Manager Mike Webb pointed out that the code section cited there was not applicable and that under a “project individualized program” it met affordability requirements. Alan Pryor in response cites basically two factors which illustrate his thinking on the proposal. As pointed out by another commenter, there is a clear difference in interpretation between Mr. Pryor and the city. Mr. Pryor is interpreting the phrase “an amount of affordability equal to or greater than the percent specified above and meet the same income targets” differently than the city. There are two requirements here, neither of which refer to the need for the two/ three bedroom equivalency. Here it becomes clear that Mr. Pryor has missed the key phrase, as “specified above.” As you can see in the chart, the phrase as “specified above” clearly refers to the first three categories. In addition to that requirement, the project is required to meet the same income targets, and, in fact, they exceed those income requirements, requiring 80 percent of median income rather than 120 percent. As Mr. Webb pointed out, there is no requirement under a project individualized plan that the city require the mix of two- and three-bedrooms. This is important because of the requirements for providing for senior affordable housing are different than providing for family affordable housing. That part is murky at best. The Social Services Commission did review the affordable housing plan at their April 2018 meeting. Does that suffice? As the commenter points out, this seems to get heavily into a matter of interpretation and technicality. My own sense is that, if challenged in court, a litigant would not win on such a technical point if they are correct. The bigger issue is whether the affordable housing program follows the law, and it appears to do so under the provisions laid out under a Project Individualized Program. Their entire case against the Affordable site pretty much goes away once you understand the Project Individualized Program. There are several other dubious claims that do not stand up under scrutiny. I think Alan must have realized he goofed when we exchanged info on Wednesday. The breakdown of the affordable housing requirements presented to the Social Services Commission, the Planning Commission and the Council ended up being 55 units. I have always said publicly that the Project of NP and Davis Senior Housing Communities was done in the category called “Project Individualised Plan”. If the Developer had provided those 55 units their obligation would be complete and their requirement fulfilled. However, working with NP and DSHC, the developer desired to do twice as much as is required. This is the first developer in Davis to give us that opportunity to do at least twice as much as required. In fact we are going to be able to do 150 apartments serving 95-100 more low income seniors than required, which is nearly three times as much. By our Eleanor Roosevelt Circle statistics of 37% of our residents being minorities with 95 more apartments that is a lot more minority seniors being served by DSHC at WDAAC. After the pounding by Alan Pryor and others on the WDAAC developer I doubt any other developer in Davis will ever voluntarily exceed the affordable housing requirements. What a shame that those most in need in our community will suffer as a result of these attacks. “developer desired to do twice as much as is required” Or the developer is doing nothing beyond donating some land which has an impaired value because it is dedicated to a single use. BTW how the the $4M valuation derived? The developer is donating some land that has a certain fair market value that has been estimated here. Is there a link to how the value is derived? 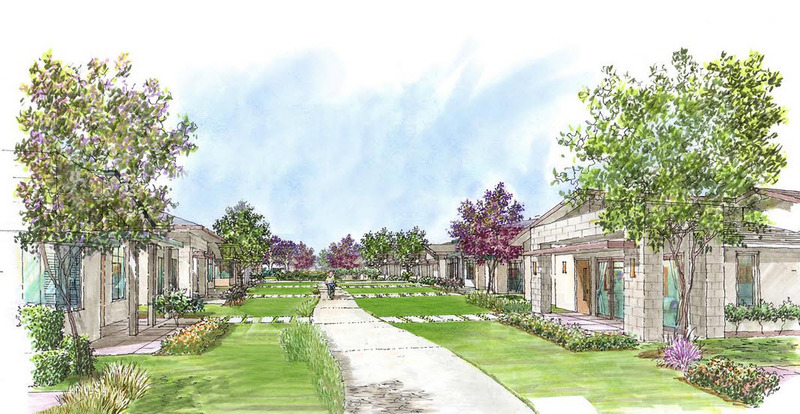 $1M/acre is high for Davis, particularly if it is dedicated to only affordable housing. “fair market value that has been estimated here” Where is the link to how the land value was estimated? Or was it more of a proctological evaluation? I have always said publicly that the Project of NP and Davis Senior Housing Communities was done in the category called “Project Individualised Plan. A few months ago Alan Pryor published a very lengthy analysis of why he thought the ordinance was not being followed. I was hoping that the WDAAC campaign would correct this record, but it appears from a conversation with David Thompson, that he while he was certain that they did not have to build two and three bedroom apartments under the ordinance for seniors, he wasn’t sure exactly why. So it seems David Thompson is now saying to us he knew all along that it was a “Project Individualized Plan” but he seemingly forgot that fact as he was talking to David Greenwald about it several days ago because Greenwald claimed “while he was certain that they did not have to build two and three bedroom apartments under the ordinance for seniors, he wasn’t sure exactly why”. Any casual observer would see the obvious discrepancy in these two statements and it would seem that Mr. Thompson or Mr. Greenwald is either not being truthful or suffers from serious lapses in memory. To resolve the discrepanacy, I would ask Mr. Thompson to provide evidence he “always said publicly that the Project of NP and Davis Senior Housing Communities was done in the category called “Project Individualised Plan“. I have never seen or heard that statement from him before..
David Greenwald is famous for accusing opponents of development projects of using “Straw Man” arguments to divert attention from the facts otherwise in evidence. For him to now come back and say that the affordable program approved for the project was actually just a “Project Individualized Program” all along but without showing a shred of evidence showing that this was the intent of the applicant, Neighborhood Partners, the Social Services Commission, the Planning Commission, and the City Council is even going beyond the “Straw Man” argument. It is entirely a fictionalized and made-up argument and certainly does not reflect well on Mr Greenwald’s self-proclaimed supposed understanding of the Affordable Housing Ordinance. You’re still in the same place as before. It doesn’t matter what David Greenwald says. It matters what the law says. It appears you misread the law and never bothered to check with this city. How can you attack a project without making sure you got your facts correct? You’re absolutely correct that it matters what the law says and not what David Greenwald says. Toward that end, I have poured through every sentence of the entire Affordable Housing Ordinance repeatedly. Judging from the generalities of your comments, it’s obvious that you have not performed the same level of due diligence or your comments would be more specific and informed. And I actually have checked with the most reliable sources of information within the City – that being the posted agendas and minutes of the Social Services and Planning Commissions and City Council meetings and taped videos of the Planning Commission and Council meetings. I do not see any reference to a “Project Individualized Program” anywhere. Indeed, I have not even seen where the Social Services and Planning Commission have even specifically approved ANY affordable housing plan at all much less the “Project Individualized Program” everybody is now claiming the City approved all along. Without specific Social Services Commission review and specific “scrutiny” of certain issues and subsequent approval, the City cannot legally approve a “Project Individualized Program” according to the Ordinance. The City Council approved a affordable plan in the Draft Development Agreement in June but that was presented to them with the inference that it was in full compliance with the AHO and certainly did not discuss the specifics of a “Project Individualized Program”. And I don’t see anywhere where it’s required to mention Project Individualized Program. Regardless, the question is whether the city is in compliance on the number of units, it appears that they are. The Social Services Commission would have had to have acted on the affordable component, unfortunately it’s not televised. You never checked with Planning Staff or the City Manager. Minutes are not definitive in my view. I was at the Social Services meeting on November 20 of last year where they took up the affordable housing projects for both WDAAC and Lincoln40. I may have an audio recording at home. But they definitely approved it without much fanfare at that time. In fact, I wrote this commentary that there was so much pushback on student housing and none on senior housing. Ha! Little did I know. Seems pretty perfunctory. No mention of a “Project Individualized Program” whatsoever. Nor did one make it into the “Affordable Housing Plan” adopted as part of the Development Agreement. I went through a lot of the docs and agree with Rik and Alan that there is no mention of “Project Individualized Program” or code sections. But there was no explanation provided at all about how the Affordable Housing Ordiance applied, no listing of any code sections, they simply appear to have determined that 150 units exceeded the city’s requirement and no one challenged it until now. You may have a point about technical violations and certainly lack of transparency, but that’s a far cry from the point you were making earlier this week when you claimed that affordable housing at WDAAC was insufficient. Fairly simply, what I was not sure about was ‘how you (Alan Pryor) came up with your formula’ as I had never ever seen that formula applied to any other development in Davis before. If your formula is applied to the Cannery how much should they have done. I don’t see 8 acres of affordable housing there? I believe I used the term Project Individualized Plan (PIP) at the CivEnergy Forum when you (or possibly Rik) raised the same question and where I provided the same answer. NP and DSHC are extremely grateful to the developer of WDAAC for their commitment to do more than double what is required. WDAAC should not be being attacked on the basis of its halving the housing affordability when it is almost tripling it. How great it would be if other developers doubled or tripled the amount of affordable housing produced. David Thompson: you recently stated on the Davis Vanguard that the 4-acre land donation was twice what was required and that only a 2-acre donation from the 75-acres site is needed. The project’s Affordable Housing Plan as contained in the Development Agreement does not provide any of the required calculations for the affordable housing requirements for the project. Nor does it discuss any kind of Project Individualized Plan to meet those requirements. I don’t see anywhere where it would be required to do so. The precise breakdown of the affordable housing requirements were laid out in the article and chart done by the Vanguard a couple of days ago. The City staff reports denoted below all referred to the fact that the developer had donated land that exceeded the affordable units provided. The cumulative number of that unit breakdown from those 200 page public reports accepted and voted on by the two commission and the council ended up being set at 60 units. That is the number of affordable units required that is memorialised in the 64 page Development Agreement between the City and the Developer in Attachment H.
Here you go with the three reports. The initial staff report on the breakdown of the housing affordability requirements for WDAAC was to the Social Services Commission on March 20, 2018. The 2+ acres of land for affordable housing at Creekside was recently appraised at $1.9 million dollars. The city and other funders used that appraisal of $1.9 million. Let’s call it a million dollars an acre. Approximately four acres at WDAAC appraised five years from now will likely have a value of close to $4 million. David Thompson: neither the Development Agreement nor the attached Affordable Housing Plan) contains any required calculation of the affordable housing requirement. There is also no Project Individualized Plan. Where can we find your calculations for your assertion that only a 2-acre land dedication is required? I can find no requirement that it needs to be identified as such. We worked with the Developer to arrive at a proposal that at least doubled the number of affordable housing units required. We have four acres of land to build 15o apartments for low income seniors. All the presiding and regulatory bodies agree that it is more units than required. We are excited about that outcome and grateful to the developer. I have no wish to discuss anything less than 150 apartments for low income seniors that was agreed to by all parties. Now tell me did the Cannery meet your affordable housing requirements? David T.: you still haven’t provided your calculations to support your claim that only a 2-acre land dedication is required. And you haven’t explained the absence of required information in the Development Agreement, or explained why there are no commitments to actually build the housing in the Development Agreement. To extend the article title’s metaphor: the more one dives into this, the fishier and fishier it becomes. Yes… on both sides of the arguments… brilliant strategy by the opponents, knowing if things get ambiguous enough, that will lead 10-15% of folk to vote “no”… if they are paying attention… here, people are… elsewhere, in the general population of folk who will vote Tuesday, not so much… amazing what you can overhear in polling places (about issues/candidates, in general)… that will be the “wild card”… who is paying attention, and for those who aren’t, how will they vote? I predict the discussion on the VG, will have about as much effect as peeing in the ocean (or, SF Bay) mailers other media, maybe 10 times that… 10 times a very small number is still a small number. I do agree it is likely to fail, because all the discussions, and ballot arguments are about as clear as SF Bay mud… for those not familiar, SF Bay mud is blue green when wet, can support about 150 pounds per square foot in area when saturated (don’t try to walk in it, you’re likely to sink up to your shoe tops), it clings, it smells bad, and when it dries, you see huge cracks in it. There will be a few seniors who vote for this that are looking to cash out and downsize, there will be 150 low income seniors who are high on the list who will vote for this, other than that I can’t imagine too many more people seeing this as a good project for the needs of Davis. I stick to my prediction of Measure L losing 57% to 43%. Thread cleanup: 4 comments removed. 1) Annual housing turnover declined from 16% in 1978 to 5% in 2015. This means that available housing stock on the market declined almost 70%, which translates into higher housing prices, thus making it less affordable. 2) Home ownership for older people increases while it declined for those who are younger. Given that income and wealth is correlated with age, this is another indicator that Prop 13 has made housing less affordable. The quotes in the article show how individuals view Prop 13 as protecting their privilege to live in a desirable location.